Times are tough all over, tough enough that some have turned to crime who really have no aptitude for it. For example, the masked gentleman who tried to rob the Washman Autospa in Portland on December 30 Authorities said that a man wearing a "white skeleton ski mask" walked into the car wash at about 10:45 a.m., pulled a gun on a worker and demanded money. So far, so good. But, according to the report, "[t]he robber then dropped the gun and it fell apart." There's nothing more frustrating than shoddy worksmanship, I always say, especially when it affects your job. You'd expect a weapon to be able to survive a three-foot fall, or else you would tether it to your wrist, I suppose. Anyway, having suddenly disarmed himself, the robber then turned to Plan B, "threaten[ing] the worker with his fist as he continued to demand money." The problem with trying to rob someone by shaking your (now empty) fist at them is that it is much easier for them to one-up you by finding a weapon of their own. In this case, the worker, since he worked at a car wash, was able to accomplish this by grabbing a power-washer nozzle, with which he sprayed the robber in the face. This ended the encounter as the unarmed man in the wet white skeleton ski mask fled down the street. 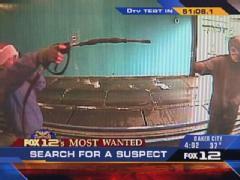 As an added bonus, the robbery was caught on video, available here, showing the man being defeated by a car-wash worker wearing a Santa hat and wielding a hose. Saddest of all, possibly, was the fact that the man was trying to rob a coin-operated car wash in the first place. This at best would have gotten him a $*&%load of quarters, but there was no sign that he had brought anything to carry them away with, so the maximum take from this robbery would have been whatever coins he could clutch. And the potential negatives include jail, injury (possibly from stepping on the shards of your broken gun) and, worst of all, the pity of local residents. "You already got people robbing banks, but now car washes?" said a man who lives nearby. "Come on, now — how low can you go?" As of today, the robber was still at large. The article tells readers that "At the time of the robbery, he was wearing a black hooded sweatshirt, black pants and a white skeleton ski mask." (He has probably taken the mask off by now, but still, be on the lookout.) He was further described as being a white man in his 20s, about 6 feet tall and 180 pounds, with dark eyes "and unusually long arms."